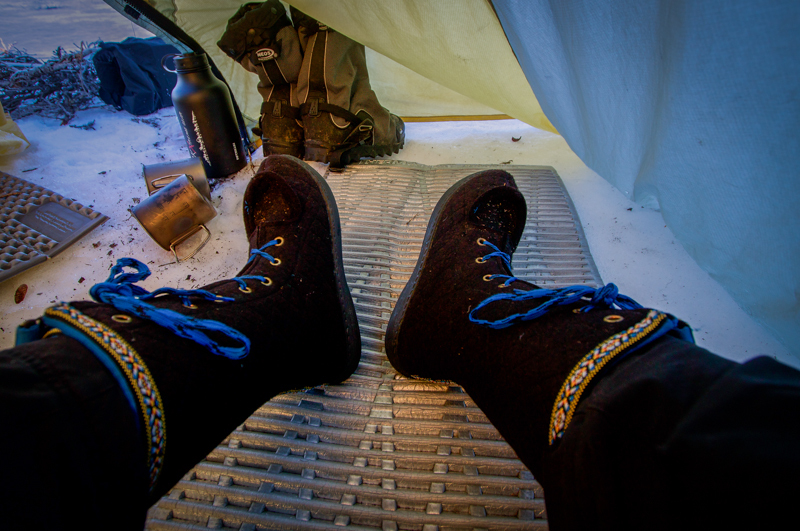 Kim has written a blog post about cold weather footwear. Frostbite is unacceptable and toes are of special concern for winter cyclists. Considering the negative consequences, I have put a lot of thought and trial into my footwear system to be used in conjunction with platform pedals. I have tested this system in temperatures as low as -30º and it works. The concept behind my set up is a thick layer of insulation that is water proofed inside and out. Waterproofing protects your insulated layers from getting soaked from your sweat and water from outside. The insulation will sustain its heat retaining ability for prolonged days on the trail. The first layer that goes on the foot is a ‘sacrificial’ wool liner sock. This sock is thin and ends up getting wet from your sweat, and basically serves for comfort. On top of the liner goes a vapor barrier sock. Bjørn and I use Sephenson Warmlite, and had our VBL (Vapor Barrier Liner) socks customized to be tall, as to fit with our tall outer boots. Over the vapor barrier goes a warm, thick sock. The VBL sock is a brilliant idea and can be applied to any footwear system. The purpose of this sock is to protect your insulation from your own sweat. Unlike other parts of your body, it is impossible to temperature regulate your feet to keep them from sweating while on the go. Your foot will sweat until it is saturated. Without the vapor barrier, the insulation from your thick sock and your boot will wick sweat away from your foot, and your foot will continue sweating until your insulation is saturated. Sweat wicking is advertised in outdoor clothing as an advantage. But in cold temperatures, water wicked into the clothing doesn’t evaporate and disappear - it freezes. Clothes can become ruined until you get a chance to dry them out. With the vapor barrier on, your foot will sweat until the liner sock is wet, then it will stop. Your insulative layers are safe. On top of my three socks, I wear two boots. The first is a high-top Loben. This is a soft-soled felt boot that is very warm. This is the most debatable component of my set up, and I may experiment with something else in the future. The Loben is, in my opinion, not a very good boot standing alone. The sole is unsupportive, and the felt provides no protection from water or wind. But worn with this combination, it provides a lot of insulation and warmth. 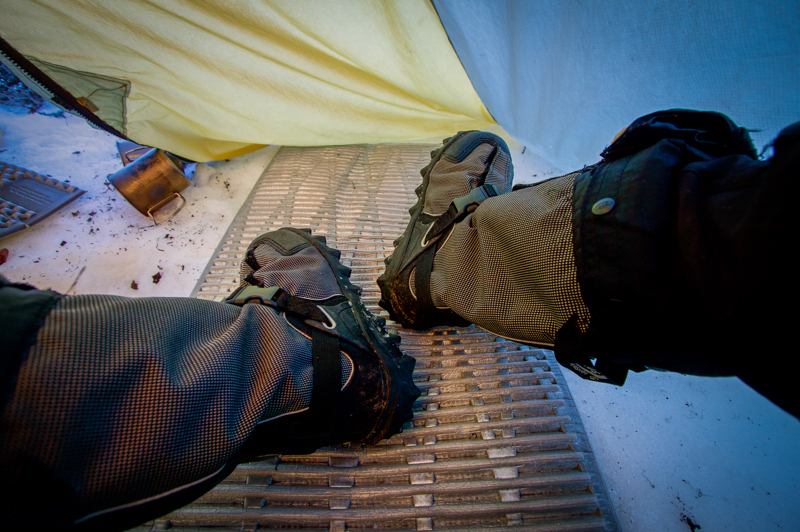 On top of the Loben I wear an insulated Neo over-boot. This boot provides more insulation, a sole with excellent traction, and waterproofing against the outside elements. The kind that I have has a fold out gaiter that reaches to the knee. Mine are not studded, because that would be annoying on my bike pedals and add weight. The sole is pretty good on ice as is. There is room to put a chemical heat pack inside during extreme cold. With all this on my feet, I feel like a storm trooper. But overall I can ride my bike and walk in comfort, without feeling cold. While I have more limited range of motion and agility, the sacrifice is completely worth it to me. If you are considering a similar set up, my recommendation would be to get boots that fit well; not too small and not too big. If they are too small you will be compressing the insulation and losing heat. If they are too big, your foot will slip around inside the boot and it will decrease your efficiency, waste energy and maybe drive you a little crazy. My Lobens are a size too big and it is regretful. I took measures to fit them to my foot, but could have avoided it by getting a better fitting boot.